This clip is from Saturday’s appearance on Fox. This one was a “debate,” but it was more like Tammy having a liberal for lunch. She also collected a bucketful of liberal tears for her coffee. Well done boss! @HeyTammyBruce LOL! 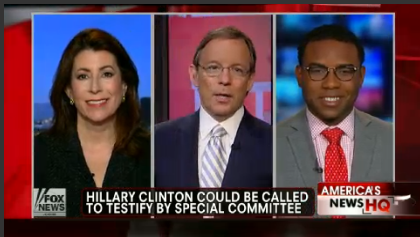 Poor Richard Fowler.He must hate having to argue with an adult. 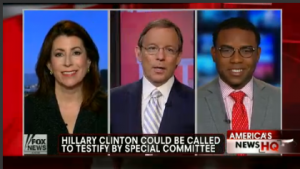 @HeyTammyBruce on @FoxNews just now, just nailed Richard Fowler to a wall. Well done, Madam. I thought Hillary looked like a bobble doll in the interview…. C’mon Shifra, don’t hold back, tell us how you REALLY feel. Bwa-ha-ha! Karen. That’s funny! I picture Hillary bob-bob-bobbling along and I can’t stop laughing! That was so much fun to watch! I thought Tammy ate his lunch. The libs brought a child to an adult debate. He was lost. Tammy, Crush, Crush, you crushed him —Loved It!! Well Done!!! The Dems concern with citizens being informed is so inspiring. Not. Excellent job, Tammy! The libs are just so pathetic! Tammy– your fact-based knowledge of Benghazi- and ALL issues- is impeccable. Love how you have your way with the limbs!! Waiting with bated breath for VA TAMCon!! Not fair! Richard took a cap gun, and Tammy took a howitzer! Bravissima! Good job Tammy. I don’t know hows these people who want to sweep this under the carpet can look at themselves in the mirror and not choke and dry heave. Steeled and empty people. Democrats are just terrified of an honest investigation. The point Richard made about an end date to the investigation is just hilarious. All that would mean would be that the democrats would have a date certain up to which they could obstruct and stonewall.